A $25 million deal earlier this week locked in a site for the tower destined to become the tallest in the Southern Hemisphere. 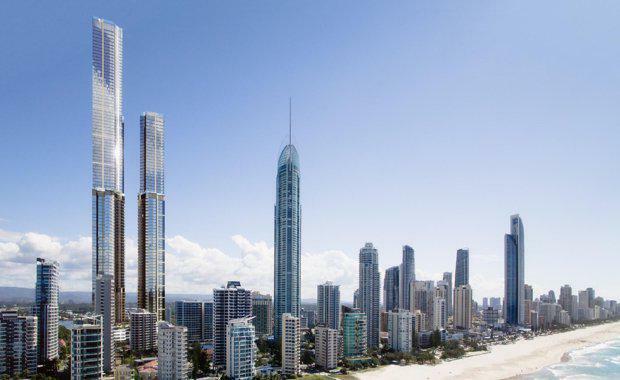 Orion International Group, the developers of the proposed Orion Towers project, settled on a 5,724 square metre parcel of land in Surfers Paradise. The settlement was completed with the help of First National Surfers Paradise agents Russell and Rob Rollington. According to the Gold Coast Bulletin, the purchase spans Enderley and Markwell avenues, with properties at 3006-3016 Surfers Paradise Blvd, 36 Markwell Ave plus 37, 39 and 41 Enderley Ave all included in the deal. It was previously purchased by ALI Holdings Pty Ltd in February, 2013 and part of the site is currently host to housing, a car rental business and the Red Lion hotel, which was built in the 1960s. CRA Group Managing Director Chris Alston confirmed the sale to the media and said the settlement made the whole process feel like "the most important step is out of the way". Developers are now ready to look towards the next steps that will see this $1.2 billion Woods Bagot-designed project become a reality on the Gold Coast. The plans are reportedly still with Gold Coast City Council. They still involve a mixed-use project featuring two super-towers rising 103 and 76 storeys, containing 1127 units. Its total height would make it the pinnacle of towers in the Southern Hemisphere, surpassing Q1’s spire by around six metres and also beating out Victoria’s 100-storey Australia 108 tower as well as Victoria’s proposed 90-storey, 323 metre One Queensbridge development. It will also feature a 680 square metre penthouse on level 100 and Australia’s highest observation restaurant on level 101.